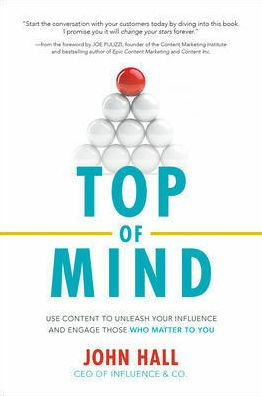 Top of Mind: Use Content to Unleash Your Influence and Engage Those Who Matter To You by marketing thought leader and keynote speaker John Hall is one of the best books I have ever read on the topic of building influence through content. I have read my fair share of books that promote the act of writing content to serve a marketing, but for me this book really touched a nerve. Any brand or person you can name off the top of your head, you are likely aware of them through the content they produce, even if it is just the interviews they have given. Putting oneself “out there” is a necessary in the branding journey, and Top of Mind is a practical guide on the WHY and HOW to get there. John Hall’s, the author, writing was deeply personal and wove together a narrative on why content is the best way to build influence. He details his early failures and struggles getting his business off the ground. The book walks through a detailed strategy on the types of content that need to be present for the target audience in each stage of the customer journey. The author drives home the need to always have a consistent content strategy which includes regular publication. Following this advice correctly will achieve the promise set forth by the book’s title of staying top of mind. As a bonus at the very end of the book, there is a detailed list of tools and technology recommendations, and the time saved and value from this section alone makes the purchase price of the book a total steal. Not to spoil this for anyone because you MUST read this book, but I need to share two anecdotes from the book that I found to be very interesting. The first story is when the author is very early into his journey of building a company. He arrives at a meeting to present on the topic of building a personal brand with content and suddenly has an epiphany that he is guilty of not taking his own advice. The rest of the book is a continued journey into how using content he was able to build a his own highly successful marketing company. This experience set the stage in the most powerful way for how content can help to build a brand presence. I’m the CEO of a content marketing company, but I’ll be the first to admit that I’m not a great writer — and that I don’t enjoy it. I’m a verbal communicator; writing just isn’t my forte. He thought it would be somewhat awkward to make such a public admission; yet, he said people really connected with him after this blog post. This is a secret fear that everyone seems to have (myself included) and making it public was a powerful lesson. These are just two of the many valuable anecdotes and lessons in this book; Top of Mind is a great book for anyone that has any thought of building a personal or corporate brand. Whatever industry you work in is surely very competitive, and with content, you can differentiate yourself by making your unique voice heard.